ANNAPOLIS, MD (February 1, 2015) – White nose syndrome (WNS or PD, Pseudogymnoascus destructans*) was first confirmed in Maryland bat overwintering hibernacula in 2010. The disease has been documented in all major bat hibernacula in Maryland with the exception of three abandoned railroad tunnels in Allegany County. During the winter of 2014, Maryland biologists participated in a nationwide study that involved using swabs to take skin samples from live bats in the tunnels and the surfaces upon which they were found. 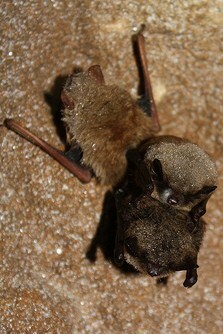 Analysis of the Maryland samples indicated that the tunnels and bats were fungus-free. Although these results continue to be puzzling to researchers, we hope to find disease-free bats again this winter. Because Maryland DNR is about to begin the 2015 bat survey, the Maryland Invasive Species Council has designated white nose syndrome fungus as the February Invader of the Month. White-nose syndrome was first discovered in a cave near Albany, New York in February 2006. WNS has been confirmed or suspected in 25 eastern and Midwestern states south to Mississippi and five eastern Canadian provinces. The cold-loving fungus attaches to the skin surfaces of hibernating bats, ingesting skin and irritating them to the point that they arouse more frequently from hibernation than healthy bats, forcing them to use up fat reserves before winter is over. As a last ditch effort to avoid death, the starving bats fly out of the hibernacula in search of insects (which are not present in the winter) and soon die. Studies also indicate that the fungus causes severe physiological imbalances and inhibits proper body functions due to skin damage, especially on the wings. Biologists estimate that 5.7 million bats in the eastern U.S. have died, with documented declines of 90-100% in WNS-affected hibernacula. Biologists suspect that the WNS fungus is a non-native pathogen recently introduced to the United States from Europe, where bats have developed immunity. Although bats can transmit the disease to each other, it is hypothesized that the fungus came to the United States on the boots or clothing of humans frequenting caves and using the same clothing and equipment without decontaminating between caves. 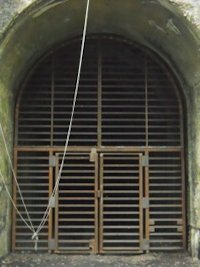 The bat species confirmed with WNS nationwide are big brown bat (Eptesicus fuscus), Eastern small-footed bat (Myotis leibii), endangered gray bat (Myotis grisescens), endangered Indiana bat (Myotis sodalis), little brown bat (Myotis lucifugus), Northern long-eared bat (Myotis septentrionalis), and tri-colored bat (Perimyotis subflavus). Maryland DNR biologists monitored Maryland bat hibernacula containing the fungus from 2009 to 2014, and reported the following precipitous declines in hibernating bats populations: 98.2% tricolored bats, 99.5% little brown bats, 100% northern long-eared bats, and 28.3% big brown bats, species which once were the most common bats hibernating in Maryland. Following the lead of other WNS-affected states, DNR hired Appalachian Lab researchers to conduct acoustic bat detector summer surveys in 2010 through 2013 in western Maryland. Acoustic surveys involve using special microphones that can detect bat echolocation calls, which are then saved automatically to a computer hard drive for call identification and analysis later in the lab. From 2010-2013, bat calls decreased by 31.5%, with a 79.9% decline in tricolored bat calls, 82.4% little brown/Indiana bats, and 64.4% Northern long-eared bats. Surveys done the summer of 2014 are still being analyzed, but these surveys clearly provided sad supporting evidence of dramatic declines of hibernating bat species. There is some good news. Bat biologists in New York and Vermont have banded little brown bats and discovered that up to 50% of little browns are returning to test sites having survived the winter in recent years. These findings give hope that some individuals will survive and that the species will eventually recover. It is important to mention that little brown bat numbers at these test sites still remain at less than 10% of the population size prior to WNS introduction. Interestingly, there are bat species which have been detected with the WNS fungus which have had no confirmation of disease: Eastern red bat (Lasiurus borealis), Southeastern bat (Myotis austroriparius), silver-haired bat (Lasionycteris noctivagans), Rafinesque’s big-eared bat (Corynorhinus rafinesquii), and Virginia big-eared bat (Corynorhinus townsendii virginianus), any of which may occur in Maryland. There is also a federally listed species found in WNS-affected areas that has not yet been confirmed with WNS or fungal infection—the Ozark big-eared bat (Corynorhinus townsendii ingens). The ecological consequences of this unprecedented loss of bats are unknown. Bats are important predators of night-flying insects, including many species that are pests for people or injurious to agriculture crops and gardens. Researchers have extrapolated from published data that the precipitous decline in North American bats could lead to agricultural losses of more than $3.7 billion annually. A single little brown bat can consume 4-8 grams of insects each night during its active season. Extrapolated conservatively to the estimate of one million bat deaths from WNS, this means that between 1.5 and 29 million pounds of insects are not being consumed in areas affected by WNS. The continuing loss of bat biodiversity and bats’ impacts on insect populations make this issue extremely urgent both economically and ecologically. For more information, see the U. S. Fish and Wildlife Service Website:https://www.whitenosesyndrome.org/. Invader of the Month diseases and other organisms. permalink.